On August 8, 2017, a patient at Waypoint Centre for Mental Health Care came out of the shower swinging. He knocked one nurse unconscious and hit two others in the head, sending all three workers to hospital. Two nurses have black eyes and contusions around their face. The third nurse suffered a loose tooth, a dislocated finger and a possible concussion. These assaults follow on the heels of another vicious attack at the same facility last week, which sent four workers to hospital. Hospitals are a place for care. Hospitals are also workplaces where workers need to be healthy – and safe. Unfortunately, that is not the case in Ontario. The truth is, workplace violence is a real threat to patients and staff. Further, there is a clear link between patient well-being and the safety of staff: care can be optimal only when staff feel secure at work. The link between patient care and worker safety was one of the main topics at the 2016 Workplace Violence Leadership Table and its four working groups. The Workplace Violence Table brought together staff from the Ministry of Labour (MOL) and the Ministry of Health and Long-Term Care (MOHLTC), unions, employers, patient advocates, and other stakeholders to make recommendations to prevent workplace violence in hospitals. This initiative is unique. It was the first time that MOL, with its worker safety focus, and MOHLTC, with its patient focus, linked their jurisdictions to come together on the issue of workplace violence since Justice Archie Campbell criticized them for not communicating during the SARS crisis. The 2003 epidemic killed two nurses and one doctor in Ontario. During SARS, JHSCs and worker safety were sidelined as everyone scrambled. It was the SARS emergency (and the inquiry that followed) that drew attention to the relationship between worker health and safety and patient care. OPSEU President Warren (Smokey) Thomas participated on the Leadership Table Committee as a strong voice for what health care workers need to be safe from violence on the job. OPSEU also participated on three of four working groups set up to focus on specific topics (hazard prevention and control, leadership and accountability, and communication and knowledge translation). There were many difficult discussions. Regrettably, in Ontario resources are scarce throughout the health care sector, which is multifaceted and complex: one solution will not fit all. Disagreement ensued on whether change should be legislated and on the extent to which requirements should be mandatory. Some issues were not resolved. linking to Accreditation Canada processes, the College of Nurses of Ontario, and postsecondary institutions. Violence is a problem in health care – period. The health care sector represents only 11.7 per cent of Ontario’s labour market, but of the 10 occupations reporting the highest incidents of workplace violence, four are health care-related. According to Thomas, we are not where we need to be yet but, if implemented, the 23 recommendations are steps in the right direction. “We need laws,” he said. “and we need mandatory requirements. Tools are useful only if an employer is willing to use them. Legislation has to be next, because some employers won’t do anything they don’t have to do. “OPSEU will participate in Phase 2, where the focus broadens to long-term care,” he continued. 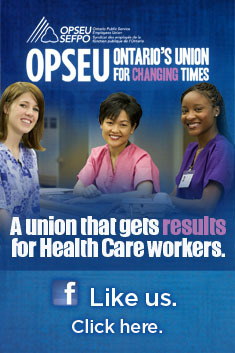 “OPSEU has 3,300 members in 37 locals in long-term care. Other sectors need to be included. Over 8,000 OPSEU members work in the mental health sector, where psychiatric hospitals show some of the highest rates of lost-time injuries from workplace violence. Put the item on the agenda of an upcoming meeting and review the report and recommendations. Prioritize recommendations for local action. Tackle a couple at a time. What follows are a few ideas in order of recommendation numbers. Recommendation 2: Create a workplace safety environmental standard for health care workplaces. Workplaces should ensure that renovation or new builds for health care workplaces are reviewed (prior to construction or renovation) from the lens of crime prevention, workplace violence prevention, and workplace safety. Until the standard is developed, workplaces should use the crime prevention through environmental design and/or CSA standards. Recommendation 3: Develop resources and supports to help hospitals create psychologically safe and healthy workplaces based on the CSA standard. Workplaces can commit to creating psychologically safe and healthy workplaces and review procedures and programs with that lens. Recommendation 4: Amend the Occupational Health and Safety Act to allow a designated worker member of the JHSC to be included in workplace violence investigations under certain circumstances. A workplace can agree to implement this now. Recommendation 6: Include more details on legislative compliance and requirements in the workplace violence section of MOL’s health care sector plan. Most workplaces do not even know what the MOL sector plan is. It is a summary of common hazards in the sector and a snapshot of what inspectors will inspect and evaluate in the coming year. The health care sector plan is available on the MOL website. All JHSCs should review the MOL sector plan at least once a year as a standing item for the committee. Recommendation 9: Amend MOL’s policy and procedure manual to ensure that all risk assessments conducted by hospitals are adequate. Workplaces can do this now. The JHSC can review, evaluate and make recommendations regarding the risk assessment process used to identify and address workplace violence. Use the Workplace Violence Risk Assessment tool referred to in Recommendation 10. Recommendation 10: Promote the use of all existing and future Public Service Health and Safety Association Violence (PSHSA) Aggression and Responsive Behaviour (VARB) tools in all Ontario hospitals. This recommendation should be a very high priority for JHSCs, because workplaces can use the existing VARB tools to evaluate their own measures and procedures for preventing workplace violence. Further, OPSEU’s Executive Board passed a 2017 resolution to endorse these tools. The toolkits address the following topics: security, organizational risk assessment, individual client risk assessment, and flagging. There will soon be one on response systems. Recommendation 11: …Develop additional tools to support incident reporting and investigation (root cause analysis), code white, patient transit (inside the facility) and transfer (outside the facility), and work refusal procedures. Workplaces can evaluate and improve their own measures and procedures to prevent workplace violence in these events. Recommendation 13: Provide more supports for patients with known aggressive or violent behaviour within health care facilities and in the community. This means having adequate staffing numbers, as well as the correct skill mix, to provide the needed care. Workplaces can evaluate or develop “surge” plans to accommodate changes in patient population or raised acuity (the intensity of nursing care required by a patient or a unit). Recommendation 14: Create and implement a standard provincial form/process to engage a patient and/or family caregiver in developing a patient’s care plan that includes safety for workers. Workplaces can evaluate whether they have a process to identify possible triggers, behaviours, and corresponding safety measures to address them. Are patients and families asked at intake if there are any triggers and what to do to prevent them? Recommendation 16: Work with the College of Nurses of Ontario to provide more clarity related to nurses’ right to refuse to provide care to patients in hazardous situations, where the hazard is violence. In the meantime, workplaces can ensure that all levels of staff understand the provisions of the Occupational Health and Safety Act that workers (including health care workers) have the right to refuse unsafe work, even if it is limited in some cases. Recommendation 17: Develop and implement a consistent minimum provincial training standard for those performing the role or function of providing security in hospitals. Security in this context does not just mean uniformed security. Anyone who responds to emergencies and is expected to intervene in incidents is considered to be performing a security function and must have adequate training. So all workplaces should examine who in their facility is performing the role of security (and it may be more than the uniformed security). Then review the security toolkit mentioned in Recommendation 10 for guidance. Until Ontario’s standard is created, security training should reflect the Canadian General Standards Board’s requirements. Recommendation 18: …addresses issues related to workplace violence incident reporting systems that capture all incidents, communicate clear reporting expectations and processes, evaluate effectiveness, develop key indicators, develop how to flag patients with a history of violence, consistency in calling code whites, address deficiencies. JHSCs should evaluate and make recommendations regarding their own systems. Recommendation 21: Expand an existing communication protocol to prepare a health care facility to receive an incoming patient for a psychiatric assessment. The JHSC can evaluate the extent to which its own workplace communicates with other facilities or health care system partners when receiving or sending patients with a history of violence. Develop a process to expect information with incoming patients and to provide information for outgoing patients. Monitor progress and keep the items open on your JHSC minutes until completed. Contact OPSEU’s Health and Safety Unit for assistance. Canadian General Standards Board’s requirements. (2008). Security Officers and Security Officer Supervisors, CAN/CGSB-133.1-2008. Gatineau, Canada: Canadian General Standards Board.